* 11 sealing screws, tightness even better, sound more full. * Stainless steel screws, corrosion-resistant, waterproof and strong, not easy to rust. * Phosphor bronze reed, corrosion resistance, aging is not easy to fall off and make the harmonica sound more beautiful mellow. * Thick copper base plate, harmonica net weight is about 83g, base plate thickness is 1.2mm. 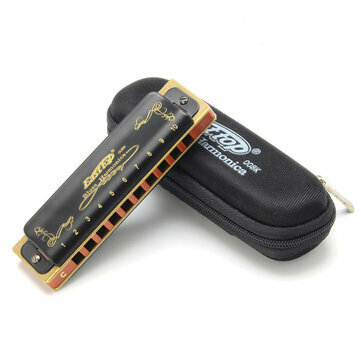 Love this Harmonica..Very easy air flow and smooth sound at all volumes..
Für diesen Preis unschlagbar. Alle Töne lassen sich einwandfrei spielen und auch die Optik des Instruments ist sehr ansprechend. Not only does it look a lot better than my old Hohner Special 20 it also sounds better on the low and high end of the notes. quality seems just as good as my old one and looks and even sounds better. I am very impressed.